While I was in Wales recently we took a day trip to Aberystwyth; mainly so we could see the sea. I wasn’t sure whether it would be a big seaside town or a teeny little place perched on the coast. As it turns out it was quite a big town but with hardly any of the chain shops you might find in similar places; plenty of support for independent traders which was nice to see. It was a classic British seaside town with a mix of big houses (now mostly B&Bs) on the seafront, little back streets and plenty of chips! We had lunch in a seafront restaurant called Baravin. 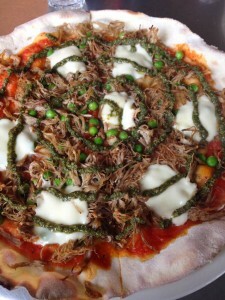 It was clean, modern and had a big open kitchen so you can peer in and see what the chefs are up to! I loved the blackboards that were all over the walls inside detailing the name and country of the craft beers on offer and there was plenty to choose from on the menu. 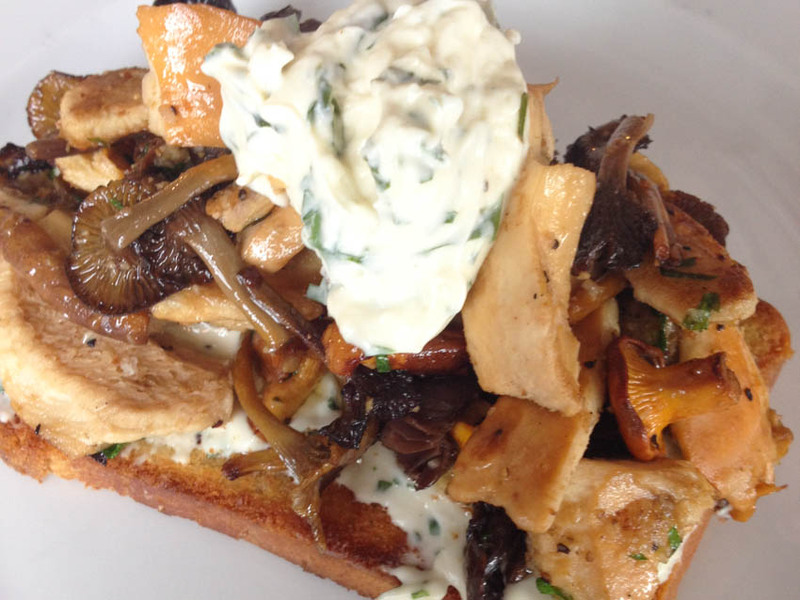 We shared a starter of wild mushrooms on toasted brioche (£5.50) which is a classic and was nice but a few more herbs and a bit of garlic would have cheered it up a bit. 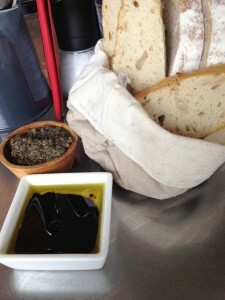 We also shared some bread with oil, vinegar and olive tapenade (£3.50); always a good way to start. The tapenade was delicious without being overly salty and I thought the bread was tasty but could have done with a few minutes in the oven to warm it up. 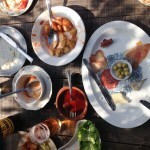 There were all sorts of dishes on the menu but the majority were pizza and pasta; some with a Welsh twist. 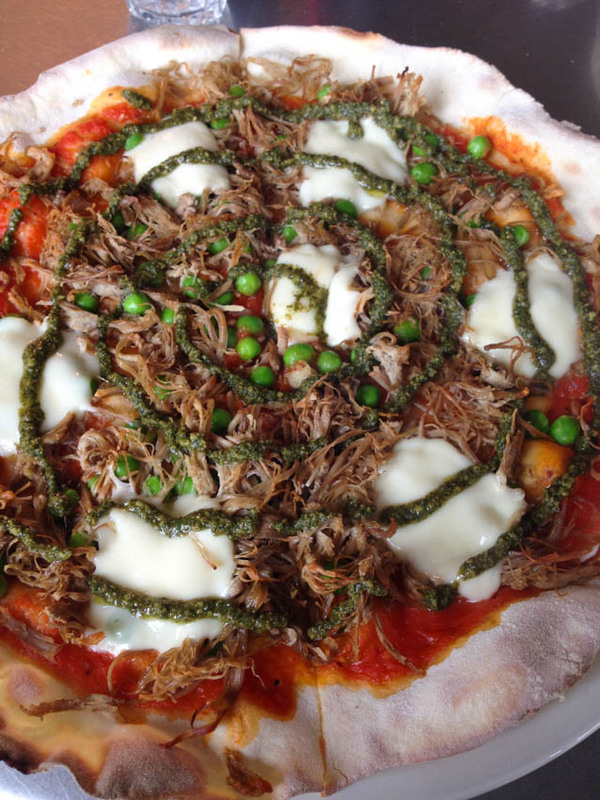 I had a pizza covered with pulled Welsh lamb, mint pesto and fresh peas (£12). It doesn’t sound like it should have worked but it really did! 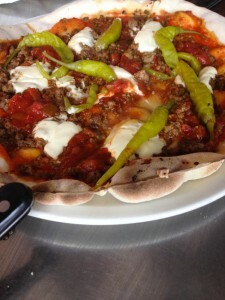 The OH had a hot Welsh chilli beef pizza (£12). Somehow we had ordered bread and bread, followed by more bread so I was pretty full and couldn’t finish my pizza which was a shame as I really enjoyed it! It was a good meal in a nice place and I think I would go back if I visited again. What I found really nice, and a welcome change, was how chatty and friendly all the staff were in the restaurant. 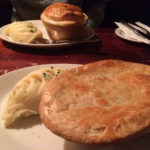 It didn’t matter who you were they made sure you were well looked after and took a genuine interest in you, the meal, what you were doing for the rest of the day and seemed in no rush to hurry anyone up. 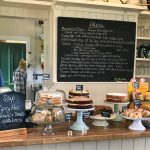 It was completely refreshing compared to the (sometimes) frosty or snobby service you can get round near me! After lunch we walked up to the castle. From there you could almost travel through time from old to modern. 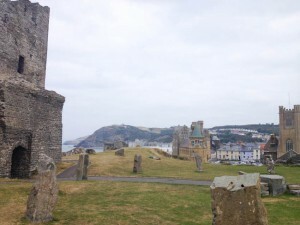 We stood in the castle ruins overlooking the Victorian buildings closest, over the rooftops of various ages and the modern buildings on the seafront across to the cable car on the hill. I liked Aberystwyth. A pretty little town which I would like to visit again, in the Summer, and eat some fish and chips on the beach. What a fun little day trip!! Fancy a little trip to Wales now! Sounds like a fun trip! And you scored some really delish food. Entertaining read — thanks. Thanks for sharing the pictures of your little trip…it sure looks like you had a great time!